Real Living agents show that they keep up with the challenging real estate market of today's economy. 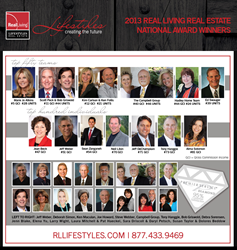 Every year Real Living Real Estate announces their top producers on a national level. This achievement recognizes the success and dedication of each realtor. Real Living offices had seven agents and seven teams recognized from the top 100 realtors. The list includes individuals as; Neil Libin (70 GCI), Sean Zanganeh (54 GCI), Jean Beck (47 GCI), Jeff Weber (51 GCI), Jeff DeChamplain (71 GCI), Tony Hanggie (73 GCI), Alma Soloman (81 GCI). The teams as; Ken Follis & Kim Carlson (12 GCI, 21 UNITS), The Hadley Home Team (44 GCI, 24 UNITS), Scott Peck & Bob Griswold (11 GCI, 44 UNITS), Marie Jo Atkins (5 GCI, 28 UNITS), Linda & Steve Campbell and Tesha Buchan (40 GCI, 47 UNITS), and Ed Swauger (39 UNITS). With the tough real estate market over the past few years Real Living has always been able to keep up with their competitors. The brokerage has continued to grow and prosper due largely in part to the excellent caliber of agents they have representing the firm. Real Living Lifestyles puts a lot of effort into their agents. The meetings that are held for the agents give them the tools to advance in their careers, not just how to eat bagels and coffee. Feel free to come by any of our office locations and visit one of our many exceptional realtors. Real Living has 7 locations to serve San Diego County, Carlsbad Village, Carmel Valley, Del Mar, Escondido, Fallbrook, La Costa/Encinitas-Forum, and Rancho Bernardo. To get to know Real Living visit: http://rllifestyles.com/.